You're looking at an X-ray of what used to be the unblemished rod of my upper right arm bone. At approximately 4:45 p.m. yesterday, that bone snapped like a breadstick. The bone is called the humerus. I'm here to tell you there is nothing funny about breaking your humerus. Of course you'll want to know how it happened. At approximately 4:44 yesterday, I was in my wife's soon-to-be-opened vintage merchantile shop here in Butte (The Backyard Bungalow at 1305 Kaw--for those of you who happen to be in the neighborhood with a bulging wallet). I was standing on a ladder, holding a board I was about to screw into the wall. We weren't sure if that board was straight or not, so my wife asked me to move to the right so she could see. I moved to the right. "A little more," she said. I moved a little more--without thinking of physics or consequences. I didn’t blackout. It was more like I had a supreme moment of being Dazed and Confused. Shock and Awe. When I lifted my head, I could see my arm lying on the floor off to my right. It didn’t look like my arm. It looked like a Thing disconnected from the rest of my body. When I tried to sit up, it went off in a different direction. My wife feels terrible about this whole thing, but I assure her that she's not to blame. It's all the fault of that little fleshy fold of my brain called Common Sense (aka the Duh Center). As part of my penance, I suppose I'll have to make a ladder-safety video for OSHA. So here I sit writing this to you from the cumulonimbus of Percocet and pecking each letter on the keyboard one at a time with my left index finger. Of course I broke my writing arm--this story wouldn't be interesting if it didn't have a plot twist. And hey, it only took me three-and-a-half hours to write this blog post! So, because I'm now a rightie forced to live in a leftie world, The Quivering Pen will probably go dim for a few weeks. Not completely dark, but posts may be a little sparse as I heal. But hey, it's all good. Because this is the first bone I've ever broken in this half-century of life (I'm not counting a hairline fracture on my collarbone from a childhood sledding accident), I'm treating this as an opportunity to do research on a future character who's missing the Duh Center in his brain. Yes, Barbara is right. Time to round up some guest bloggers? You write funny even when in pain, or blurred pain. Of course you're exempted from regular blog posts. But if no one believes your excuse, get your doctor to write you a note...and then post that! Are you still planning to tour next week? I'll volunteer to be your page turner at Auntie's. And, Spokane being Spokane, we can probs hook you up with some pain killers. Yes, I'm still planning to be at Auntie's (and Powell's and Elliot Bay). Unless the doctor comes back and says the arm has to be amputated. Then that might put a damper on things. Ugh, David. 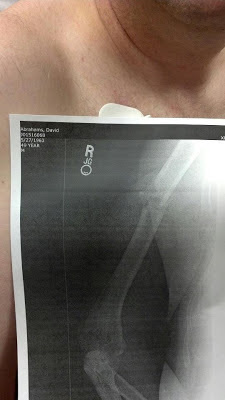 Breaking your humerus is about as humorous as hitting your funny bone is funny. I have three words for you: Voice Recognition Software. OK, and three more: Heal up quickly! Buy Now & Save 25%! Dragon speech recognition software makes it easier for anyone to use a computer. You talk, and it types. Use your voice to create and edit documents or emails, launch applications, open files, control your mouse, and more. Quickly and easily capture your thoughts and ideas while Dragon helps you get more done faster. Oh Mr. Wonderful, I see you are shirtless in Montana. I think maybe in addition to nurse duties and driving, that your bride should rescue you from hunt and peck as well. Sorry to hear this, David. Will force you to take it easy, though! Heal quickly. My First Time: Ron Currie Jr.